The story of the kidnapping of Patty Hearst has all the ingredients of compelling history. Start with a celebrity, here the granddaughter of publishing magnate William Randolph Hearst. Add in some violent crime, police shoot-outs, political revolutionaries and, finally, a highly covered criminal trial with a flamboyant defense attorney more than willing to appear in front of television cameras to argue for his client. But these elements alone do not make AMERICAN HEIRESS a riveting book that skillfully captures the saga and spirit of the 1970s. Author Jeffrey Toobin presents this stormy decade with the extraordinary skill of a true historian, placing Hearst, her abduction and her kidnappers in the context of an America that 40 years ago faced many of the same tribulations and fears that presently confront our citizenry. The day of the kidnapping was February 4, 1974. In the ’70s Americans found themselves living in dystopian times. Californians were terrorized by two serial murderers, the Zodiac Killer and the Zebra Killer. In the years when Hearst went from being a kidnap victim to an avowed revolutionary, Americans would experience two assassination attempts on Gerald Ford, who came to the presidency having been elected neither President nor Vice President. In the year of her abduction, America was the site of hundreds of politically inspired bombings and deaths. Shortly thereafter, the country would experience the horror of the Jonestown mass suicides. America was a nation on edge. "Jeffrey Toobin presents this stormy decade with the extraordinary skill of a true historian, placing Hearst, her abduction and her kidnappers in the context of an America that 40 years ago faced many of the same tribulations and fears that presently confront our citizenry." On that February evening, Hearst was living in a Berkeley, California student apartment with her fiancé, Steven Weed. Hearst had met Weed while attending Crystal Springs School for Girls, an exclusive school for daughters of the wealthy. Weed had recently graduated from Princeton and had taken time off from school to teach. Now he was in graduate school at Berkeley, and their engagement had just been announced on the Hearst newspaper society pages. The calm of the evening was broken when armed abductors invaded the apartment, overwhelmed Weed and, after subduing Hearst, placed her in a stolen car and fled from the area. Hearst’s captors were a ragtag group of revolutionaries calling themselves the Symbionese Liberation Army, eight individuals whose skills Toobin suggests were embarrassing. Yet somehow they evaded detection by a national manhunt led by the FBI. For 18 months, Hearst remained a fugitive; during that period of time, she went from debutante to revolutionary Tania. She proclaimed her loyalty to the SLA on videos and was identified as a participant in three bank robberies, one that resulted in the death of a victim. At one point in the manhunt, Los Angeles police authorities and the FBI circled a home where the revolutionaries were believed to have been hiding. Through the new technology of the mini-camera, the siege was broadcast on national television. It was a massive firefight that destroyed the house and killed five SLA members. It was not until days later when it was learned that Hearst wasn't even there; she had watched the military-style operation on television from a hotel near Disneyland. After 18 months, Hearst was finally captured and charged with federal offenses. The family hired F. Lee Bailey, then considered one of America’s best criminal attorneys (at least in his mind). Toobin outlines the trial and the difficulties that both sides faced in the complex case. 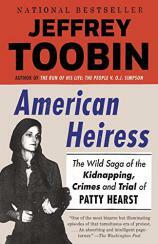 A lawyer by trade, Toobin’s discussion of the case is probably the most interesting portion of AMERICAN HEIRESS. Hearst was convicted and sentenced to seven years in federal prison. Over the strong objections of law enforcement, President Jimmy Carter commuted her sentence in 1979; she had served just 22 months. The passage of decades makes much of the Hearst saga old news. But there still remains questions as to whether she was a victim or a willing participant in the crimes surrounding her kidnapping. For now, Toobin’s narrative of her life and times is a comprehensive and thoughtful presentation of the events of that turbulent era in American history.